Shristi was established in the year 1995 to fulfill the need of a centre where children with Mental Retardation, Down syndrome, Cerebral Palsy, Slow learners, Autism, Learning Disabilities could be managed holistically. Shristi was established in the year 1995 to fulfill the need of a centre where children with Mental Retardation, Down syndrome, Cerebral Palsy, Slow learners, Autism , Learning Disabilities could be managed holistically. Shristi came into being to promote inclusion at all levels i.e education, vocation and community. Shristi is not just about educating the differently able, the children in the centre receive therapies ( special education, occupational & speech therapy), work upon their academic and social skills and receive vocational training to ultimately become self supporting. Our centers provide early detection and intervention for such children. The period of over two decades has been attributed to the process of learning and growing towards excellence in managing such children. Our centers are located at Vivek Vihar in Delhi, Vasundhara in Ghaziabad and at Kolkata for children with learning disabilities through its project Sensorium. It conducts and provides early detection, awareness, research, advocacy and remedial training to public school going children. Besides, Shristi also runs three special schools (Nursery to XII) which offers clinical teaching in the mornings at Vivek Vihar , Vasundhara. The students appear for their 10th and 12th std. under the National Institute of Open Schooling (NIOS). The children are also trained in daily living skills, social skills and vocational training through a child centric educational plan. Shristi has established Resource Centers in public schools in Delhi and Ghaziabad and conducts certified courses in Learning Disability and Autism at Delhi, Vasundhara and Kolkata for manpower development to meet the growing demand of professionals in the field. Shristi has conducted the 1st National Workshop on Learning Disability in collaboration with Indian Academy of Pediatrics (IAP) in 2002 and has conducted over hundred workshops in schools and institutions all over the country. 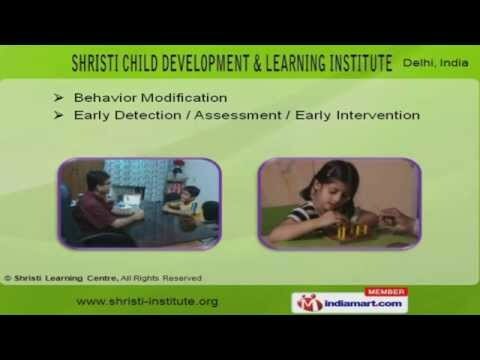 Shristi learning centers have a team of very dedicated and learned therapists, educators, trainers and counselors. Time by time we work out awareness programs to reach out at an individual level to the masses. And our staff members stay cognizant regarding the developments in the field so that we can succor in best possible way. To sensitize the system, reach out to most vulnerable groups, provide them professional services to build up their self esteem and help them to live a sustainable life. Shristi would also serve as a resource base for training, research and documentation in child and adolescent mental health.